This Trainee Manual accompanies The Training Curriculum (ISBN 978-1-59738-098-0), a loose-leaf manual for supervisors, sold separately. 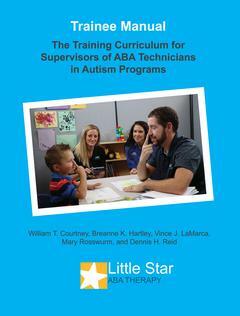 Training Curriculum for Supervisors of ABA Technicians in Autism Programs is designed to train supervisors and aspiring supervisors in evidence-based methods of supervising staff who provide applied behavior analysis services for people with autism. There are several training curricula available in regards to training BCBAs on how to supervise fieldwork experience. This curriculum takes on the area in which BCBAs frequently find themselves, which is supervising paraprofessionals who provide comprehensive and/or focused ABA therapy in intensive settings. Paraprofessionals who provide ABA services in these settings have many different titles. One formal title is Registered Behavior Technician, a title developed and endorsed by the BACB for credentialed paraprofessionals. More informal titles include technician, therapist, teaching assistant, instructor, one-to-one staff, shadows, and superheroes. This curriculum is filled with evidence-based strategies that provide a solid foundation, and fill a gap in ABA technicians. The content includes critical supervision knowledge and skills coinciding with the Behavior Analysis Certification Board (BACB©) task list for effective supervision, and provides the BACB’s required eight hours of supervision training. If the Curriculum is presented by a BACB Approved Continuing Education (ACE) provider, participating trainees can also receive continuing education credits. The curriculum is performance- and competency-based, requiring trainees to meet classroom and on-the-job criteria to successfully complete the training.